Radoviš (Macedonian: Радовиш [ˈradɔviʃ]) is a city in the southeastern part of the Republic of Macedonia. It is the second largest city in the southeastern region. The city is the seat of Radoviš Municipality, which is spread on the bottom of Plačkovica Mountain and the northern part of the Radoviš-Strumica valley. The main road M6 Štip–Radoviš-Strumica is tangentially placed on the township of Radoviš. This road is a main communication route with other parts of the country. 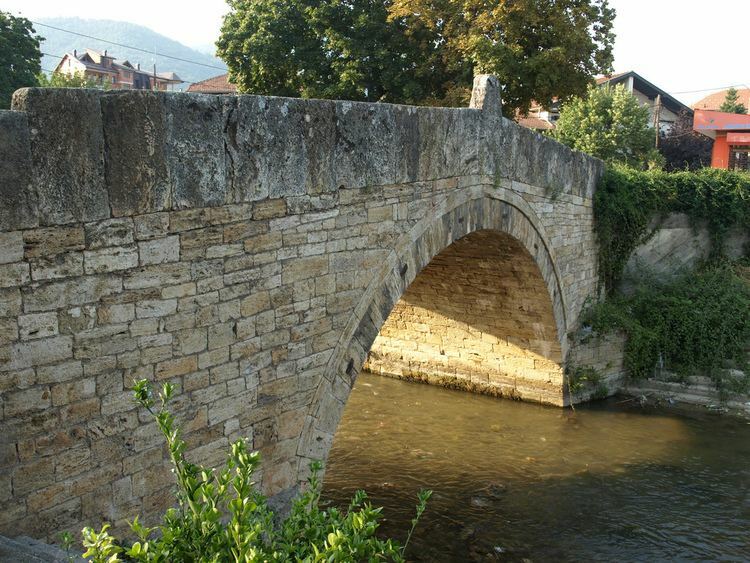 The town of Radoviš was mentioned for the first time in 1019 during the reign of the Byzantine King Basil II (which was the name of the town during the Middle Ages. At this time in history, Radoviš is an important center for regional trade, craftsmanship and mining. At that time, the town was located in the North-West of the town's present location, on the banks of the Old river, where we can find traces of several churches, for example St. Archangel church. In the 14th century, after the withdrawal of the Byzantine Empire, Radoviš found itself in the Serb medieval state. In 1361, the tsar Uroš sojourned in Radoviš. During the Ottoman Empire, in the 17th Century under the Kyustendil sanjak, it belonged to the diocese of the Kustendil metropolitan. At that time, the town had 3,000–4,000 inhabitants. The Medieval period of Radoviš is characterized by the expansion and development of Radoviš and its surroundings. The economical, political and educational histories of the region can attest to this. In the territory of the Municipality of Radoviš are located both explored and unexplored archeological sites, monasteries, and churches all of which are truly a part of a rich heritage of culture monuments. In addition, this territory dates back to prehistoric times and contain artifacts from the Neolithic, Eneolithic, Halsta and the Bronze Ages. In the time of Philip the Second and Alexander the Great, poems about the territory of the Municipality of Radoviš were written. Also, numerous remains date back to Roman times and even earlier. Additional findings include ancient settlements, terms and aqueducts. The Turkish name for the town is Radoviş, relevant during Ottoman rule. The Serbo-Croat name (used 1913-1943) is Radovište (Радовиште). The area of the municipality is 608 km². Radoviš municipality has 28,244 inhabitants, according to the last census (2002). Population density is 56/km². It is populated mainly with Macedonians and partly with Turkish minority. In the Municipality of Radoviš ethnic conflicts and intolerance are unknown. 36 villages are also part of the municipality of Radoviš. The mayor of Radoviš is elected directly through a local election. The current mayor is Saško Nikolov. He won the local election in 2013. The party that won the local election in 2013 and the general election in 2011 was VMRO-DPMNE. The climate of Radoviš is moderate Mediterranean-Continental. With hot and dry summers. Winters are characteristic for their coldness, wetness and the snow falls very often. Average annual temperatures range from 12.5 to 13.0 °C in the valley and at the highest parts of the mountain ranges up to 7.5 °C (45 °F). The warmest months are July and August, when the temperatures are usually above 31 °C (88 °F), and often reach 40 °C (104 °F), and the average is 23 °C (73 °F). The coldest month is January with an average temperature of 1.2 °C (34 °F). The average annual precipitation is 563 mm, with large fluctuations from year to year, but there is a difference between the mountain and the valley. As to the annual sum of sunshine hours, the region has 2326 sunshine hours per year, 6.4 hours per day, and 112 sunny days a year. According to the census performed in 2002, the population of the city of Radoviš is 16,233 inhabitants, while in the municipality including the villages 28,244 inhabitants. Radoviš is a mainly Orthodox city, with minorities of Muslims, Protestants and Catholics. There are three Orthodox churches, the new one Holy Trinity, the old one St.Ilija, and St. King Constantine and Queen Heena from the 18th century. There are also Orthodox monasteries such as those of St. Archangel Michael, St. Pantaleon and St. George. There are also various Protestant churches, such as two Methodist churches, a Baptist church and a Jehovah's Witnesses Kingdom Hall; as well as two mosques. Radoviš is linked with the neighbour cities Štip and Strumica by road. The national road M6 passes near Radoviš. It is the only way to arrive in the city. To the north the closest city is Štip (37 km from Radoviš), and to the south Strumica (29 km). Radoviš is 121 km far from the capital Skopje. The closest airport is Skopje Alexander the Great Airport located near the capital Skopje, 108 km north from Radoviš. The Radoviš bus station is located on the boulevard Alexander Makedonski, it is 500 meters far from the city center. The bus station connects the city with the capital Skopje, Bitola, Prilep and the neibourgh cities. Taxis are all over the city. The price for a drive in the city is about 0.80 euro or 50 Macedonian denars. Taxis can also drive to the villages or to other Macedonian cities. There are two private television channels - TV EMI and TV Kobra, also two cable TV operators - AndesNet, DVB-T (MPEG-4) - BoomTV, DirectToHome TV - TotalTV, Internet Providers (Cable, ADSL, WDSL, WiFi) and WiFi hotspots across the city. The three national mobile operators have full 3G coverage. 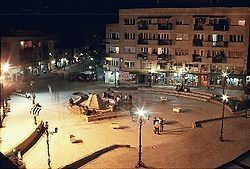 The people in Radoviš, especially its youngest inhabitants, like sports. Favorite sports are Football, Basketball, Handball, Fishing, etc. Radoviš has its own Football club: FK Plačkovica, Handball club: RK Radoviš, also and Fishing club: Carp-Radoviš,. "Lebari" are the supporters of the Radoviš sport clubs. The supporters club "Lebari" (Macedonian: Лебари) was formed in 1991. They generally support all clubs in Radoviš, and mostly wear green and yellow simbols, which are the group colours. In the past and now, Radoviš rightly carries the attribute of a sports city. It can be freely called "The metropolis of wrestling in free and Greco-Roman style" in Europe and worldwide after Radoviš' favorite club BK "Bučim-Radovis" won the titles "European Club Champion in 1995" and "World Club Champion in 1996". The final competition for those titles as well as for many other tournaments such as "Balkan Championship in Wrestling, Free and Greco-Roman Style" 1991 and "Macedonian Pearl" were held in the Sport Center in Radoviš "25 Maj". The new sport center Šampion (Macedonian: Спортски Центар и Ресторан Шампион - Радовиш) was built in 1999, and consists of: Olympic swimming pool, small swimming pool, tennis courts, basketball courts, table tennis facility, handball court, soccer fields, gym and a restaurant. OOU Krste Petkov Misirkov - Radoviš with about 1300 students, from 6 to 14 years old. OOU Nikola Karev - Radoviš with about 1100 students, from 6 to 14 years old. SOU Kosta Susinov - Radoviš with about 1200 students from 15 to 18 years old, where students can choose among these programs: Gymnasium, Metallurgy technician, and Electro-technician for Computer Technics and Automatics. Faculty of Electrical engineering, part of the Goce Delčev University of Štip. The economy of Radoviš runs through several activities such as: Mining, Building and Construction, Agriculture, Livestock Farming, Business and Trading, Tourism and Hospitality, Banking, Insurance, Health Industry, Crafts, Services, Transportation and traveling agencies. - Bučim (Бучим) - the only active mine in the Municipality of Radoviš and the only mine for copper and gold in Macedonia. Bučim employs about 500 people. It is one of the most important industrial object in Radoviš and a driving force of the Radoviš industry and economy. The mine (directly and indirectly) contributed significantly to the initiation of other industrial activities such as the building industry, business, hospitality industry, transport and others. - TEHNIKA is the largest building company. Besides "Tehnika" there are many other entrepreneurs in the building industry. Their activities are mainly focused toward the individual building of residential housing and building of small industrial objects as well as weekend houses.